Aluminium chloride, AlCl3, is well-known as a catalyst for organic reactions. This compound is soluble in water, hydrogen chloride, ethanol, chloroform, CCl4 and is slightly soluble in benzene. It is a silver-white powder, but sometimes turns to yellow if they are contaminated by ferric chloride. It tends to absorb water easily (hygroscopic) to form monohydrate or hexahydrate. Aluminium chloride is a corrosive substance and it is also very toxic. It can cause high damage to the eyes, skin, and respiratory systems if inhaled or upon contact. Aluminium chloride is widely used for Friedel-Crafts reaction as a catalyst. AlCl3 works as an electron acceptor (Lewis Acid). AlCl3 is able to direct the reaction more efficiently and effectively. This catalyst is used to synthesise alkyl benzene from alkyl halide and benzene. It is also used for many industrial applications such as petrochemical manufacture, pharmaceuticals, dyes intermediates and others organic chemicals. Moreover, it can be used for metallurgical industry, cosmetics, antiperspirants, metallurgical industry, and lubricants. There are mainly two ways of synthesis: manufacturing aluminium chloride with chlorine or hydrogen chloride or obtaining aluminium chloride by extraction from raw materials. In the former method, aluminium chloride is widely manufactured by reacting with an aluminium metal with chlorine or hydrogen chloride. This reaction occurs at temperature ranging from 650 to 750°C and is classified as an exothermic reaction. In the latter method, to produce aluminium chloride, the aluminium metals can be extracted from raw material, such as clay or fly ash. b) Dissolving the alumina fraction into soluble aluminium chloride by HCl leaching of calcined clay. f) Heating the aluminium chloride hexahydrate crystals to a temperature up to about 450°C. g) Reducing aluminium chloride hexahydrate crystals to form anhydrous aluminium chloride. Aluminium chloride is used to make aluminium metal. Due to its explosive reaction upon contact with water, it requires care in such situations. It can be combined with aluminium as a catalyst to synthesize metal complexes using a process called Fisher-Hafner synthesis. The primary components of this reaction are metal halides. Besides, aluminium chloride is also applied as a flux and in the electrolytic production of aluminium melting. It is also necessary in the manufacturing of titanium dioxide and butyl rubber. 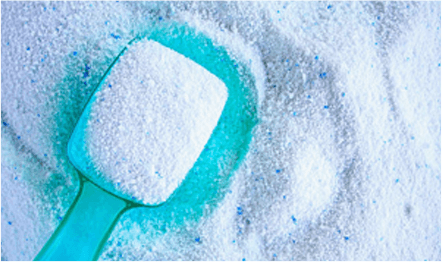 It is used in the process of manufacturing dodecylbenzene, a colourless liquid which is a precursor to sodium dodecylbenzenesulfonate, an important component (15%) in laundry detergent. In the process of manufacturing sodium dodecylbenzenesulfonate for the laundry industry, AlCl3 acts as an acid catalyst when alkene is reacted with excess benzene to form alkylbenzene compound. The resulting mixture is sulfonated to produce sulfonic acid which is neutralized with alkali to give sodium dodecylbenzenesulfonate. The most important aluminium chloride in a chemical reaction is its role as a catalyst in Freidel-Crafts reactions. In these reactions, aluminium chloride is used to prepare anthraquinone, which is used in the dyestuffs industry. Aluminium chloride is also used to insert aldehyde groups in aromatic system rings, the general process used for this is the Gattermann-Koch reaction. AlCl3 act as a catalyst in the “ene –reaction” and is used in manufacturing of polystyrene. AlCl3 alkylation process produce chemicals that are used in production of detergents and ethyl benzene. Aluminium chloride is utilized for the isomerization and compounding of hydrocarbons, and supports in the polymerization of hydrocarbons with lighter molecular weight, the compound is mainly used in the petrochemical industry. Aluminium chloride is used as a coagulant for many industrial and sanitary wastewater treatment applications, because of its high efficiency, effectiveness in clarification, and utility as a sludge dewatering agent. The chemical leaves no residual colour and offers very good turbidity removal. The hexahydrate form of aluminium chloride has little applications, usually as a component in many cosmetic products and toiletries. Hydrated aluminium chloride is often applied in low concentrations in antiperspirants. Prescription products used to control hyperhidrosis have a higher concentration of the compound. There have also been clinical trials to understand the impact of aluminium chloride used in anti-acne preparations.